Thanks to what amounted to eight hours of overtime for every eight hours of regular pay, William Harris Jr. rose to the top of the heap last year. 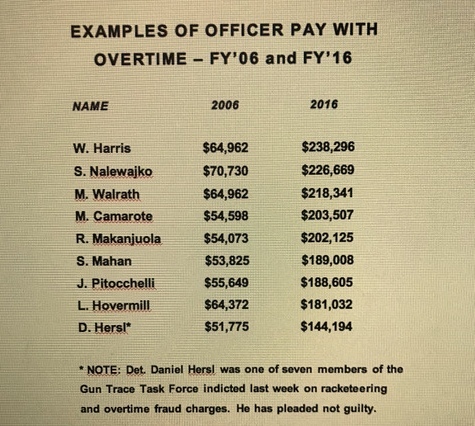 Overtime payments of $142,000 – on top of his annual salary of $96,000 – made Sergeant Harris the highest paid employee in Baltimore City government. His $238,295.96 paycheck in fiscal 2016 was fatter than that of the mayor, the state’s attorney, the health commissioner, the finance director, the director of public works and Police Commissioner Kevin Davis himself. Harris, who holds the rank of sergeant and has not participated in a criminal case in Baltimore courts since 2003, according to the Maryland Judiciary Case Search, is not alone. 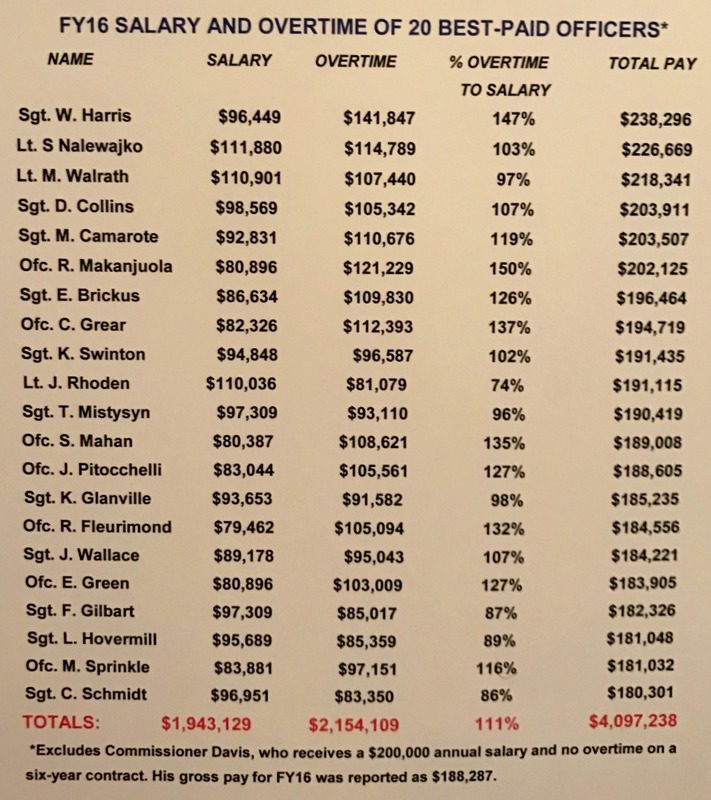 A review of the city payroll, available on the Open Baltimore database, reveals how generous overtime allows rank-and-file officers and sergeants to earn more than their own command staff. Ever since the city signed a 2014 contract with the Fraternal Order of Police aimed at improving crime-fighting while reducing overtime, extra pay beyond normal working hours has surged at the Baltimore Police Department. At the same time, overtime pay at the Fire Department, where overtime for paramedics and firefighters was once rampant, has noticeably declined. 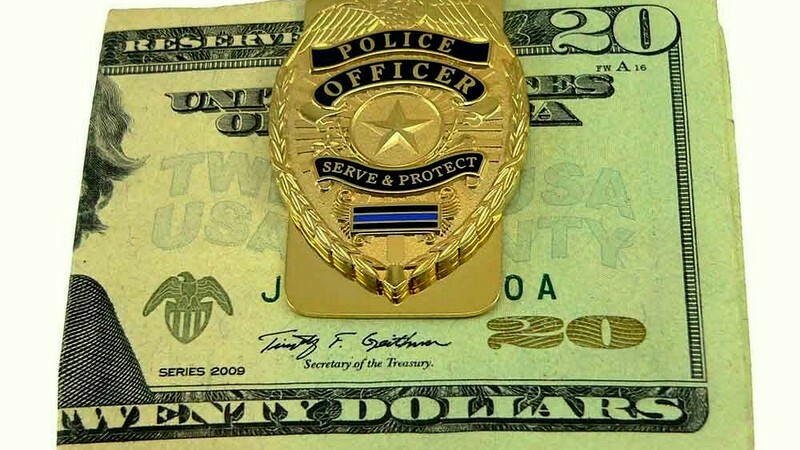 • 22 of the 25 highest-paid were police officers. • 122 of the 150 highest-paid were police officers. • 57 officers took home more money than then-Mayor Stephanie Rawlings-Blake. • 87 officers (all ranked below captain) had higher paychecks than their commanders, Deputy Police Commissioners Darryl De Sousa and Dean Palmere, who are not eligible for overtime. • More than 200 officers earned more than most of the members of the Rawlings-Blake cabinet. • More than 500 officers got higher paychecks than City Council President Jack Young and Comptroller Joan Pratt. With city schools in the hole for $130 million and the city itself facing a looming budget deficit, the price of maintaining the city’s police force, the 8th largest in the country, has come under question on social media and in public meetings. To be sure, the criticism comes in the context of a crime- and violence-plagued city, in which homicides-per-capita in the last year were the second highest in Baltimore’s history. The bloodshed continues this year, most recently with a man shot to death on a Charm City Circulator bus. Still with so many competing needs, residents debate whether the persistent bloodshed explains – or rather calls into question – the high spending for public safety. Last week’s federal indictment of seven Gun Trace Task Force members for overtime fraud (as well as allegedly extorting money from citizens and making false arrests) added gasoline to the fire. With wiretapped conversations of two officers discussing how, through fraudulent claims, “we get paid two times,” the optics of overtime had shifted at City Hall from spending anything to curb crime to demanding that law enforcement police its own expenditures. “We allow police overtime to run up when a lot of other areas of the city, like schools, housing and parks and recreation, could benefit from that money,” Mayor Catherine Pugh said last week. In response to the indictments, Police Commissioner Davis demoted Lt. Colonel Sean Miller, who was responsible for the Gun Trace Task Force as head of the police department’s “war room,” and has reassigned 46 members of the centralized intelligence unit back into uniformed patrol. To provide some hard data about how overtime works in individual cases, The Brew broke down the salaries and overtime of the 20 best-paid officers culled from the Open Baltimore database. As a group, the officers pocketed more from overtime ($2.15 million) than from their regular pay ($1.94 million). With overtime set at 1½ times an officer’s hourly wage – or 5.33 hours of overtime equaling 8 hours of regular pay – some of the officers were claiming to have consistently worked 13- to 16-hour workdays throughout the year. The Brew emailed questions to the police department, noting the high overtime pay of some officers and asking for information about their assignments that would justify such long hours of duty. More broadly, we asked the BPD about what controls are in place for reviewing and approving overtime. Other than expressing surprise at how The Brew got the overtime figures, T.J. Smith, director of media relations, has not responded to the questions. For the last six years, police overtime has exceeded the amount placed in the budget to account for staff shortages and related costs. This year, police overtime is running $27.5 million above the projected $16.5 million, making a grand total of between $43 million and $44 million in overtime by the end of the fiscal year on June 30. What’s apparent from the figures is that the 2014 contract signed by the Rawlings-Blake administration with Fraternal Order of Police Lodge 3 is a bust. It was designed to boost police base pay 13% to stay competitive with suburban jurisdictions but lower overtime through more flexible scheduling. Instead, both overtime and base pay have increased rapidly, payroll data from Open Baltimore shows. Adding another layer of irony, police retirements and resignations are also going up, causing severance pay projections of $4 million this year, according to budget director Andrew Kleine. Is Another Audit the Solution? In reaction to the indictments, Mayor Pugh has called for an audit of the police department. This comes just months after the city released, on November 30, a $200,000 audit by CliftonLarsonAllen that gave the department a clean bill of health. The CliftonLarsonAllen audit, part of the quadrennial audit program that voters approved in 2012, did not review time requests and overtime pay. Instead, it was a “desktop audit” that broadly reconciled police accounts and addressed various accounting issues. The audit made no effort to uncover the alleged overtime fraud revealed in last week’s indictments by means of federal wiretaps and a review of overtime sheets where the indicted officers “swore” that the hours reflected on their overtime requests were truthful. The limitations of a traditional audit, when the paperwork itself is allegedly false and fraudulent, raises the question of how meaningful the audit proposed by Mayor Pugh would be. A major conclusion that can be drawn from this analysis of the Open Baltimore pay data is that pulling down significant overtime is not an anomaly but a way of life in the police department. The vast majority of rank-and-file officers collected between $5,000 and $25,000 last year from overtime. There are a few rank-and-file officers that do not get overtime pay – very few – while there are some officers who appear to push the limit. • Dancy Debrosse, a trainee at the Police Academy, claimed $74,539.10 in overtime last year on top of his regular $66,122 salary, for a grand total of $140,661.10. No other academy employee filed for remotely as much overtime. • Two community service officers, Robin Johnson and Corrina Artis Johnson, boosted their 2016 take-home pay by more than 80% with overtime. • Officers Khandy Al-Quarishy, Charles Anderson, Joseph Brown Jr., Joseph Dobry, Frank Golimowski, Lamacairos Taylor and James Tolson II all doubled their annual pay last year. In the case of Al-Quarishy, overtime amounted to 123% of his annual salary, making his gross earnings $160,118. During this period, according to the Maryland Judiciary Case Search, Al-Quarishy brought forward no criminal cases, but did, on May 31, 2016, write up a warrant involving the malicious destruction of property valued at $1,000. Generous overtime also extended to the civilian ranks. Police Department secretaries Karen Alleyne and Myrna Milburn, for example, each earned more than $20,000 in overtime last year, with Alleyne earning $28,312 to supplement her $47,538 “Secretary III” salary. In other city departments, including Public Works, Recreation and Parks, Human Services, Housing and Community Development, Comptroller’s Office and General Services, secretaries did not receive overtime last year. In the Fire and Finance departments, there were relatively small overtime allotments for ‘”Secretary III” staff. In terms of overall overtime, Lt. Stephen Nalewajko, a veteran detective who specializes in drug busts, is a consistent leader. Over the last five years, he has taken $450,118 in overtime, Open Baltimore records show. Like many police officers, Nalewajko’s gross pay increased in the wake of former Mayor Martin O’Malley’s “zero tolerance” policing practices, then took a big leap forward after the city signed the 2014 contract with the Fraternal Order of Police. Sources: www.scribd.com, “Baltimore Police With Overtime, 2006” and Open Baltimore Database, Fiscal 2016. The data show that gross pay for the nine officers shot up from $534,946 in 2006 to $1,791,777 in 2016. Or stated differently: the city paid 3½ times more for the same policing personnel last year than it did a decade before.